Singapore Airlines-Tata joint venture proposal would be a big boost for SIA - and AirAsia? Singapore Airlines (SIA) has taken a major step forward in implementing its new long-term strategy with the proposed establishment of a joint venture carrier in India with Indian conglomerate Tata. The SIA Group will have a 49% stake in the new full-service carrier, giving SIA a major presence in a strategically important market. Tata will have a majority 51% stake, giving it a second carrier in its portfolio along with AirAsia India and a two-brand strategy that follows the formula increasingly used by airline groups throughout Asia. For SIA, close involvement and equity in a new airline in India follows the acquisition of a 19.9% stake in partner Virgin Australia. Australia, India and China are SIA’s key markets and of strategic interest to the group as it increases focus on the fast-growing Asia-Pacific region. A partnership with and potential investment in a Chinese carrier is the only remaining missing major piece of the puzzle SIA has been working on since Goh Choon Phong took over as CEO at the beginning of 2011. Mr Goh’s bold new strategy also includes investments in the budget end of the market, again with a focus on the Asia-Pacific region which comes as SIA tries to reduce its reliance on the long-haul passenger and cargo markets. SIA has recognised the opportunities in faster growing budget end with the launch of Scoot and increased involvement in Tigerair but also wants to maintain its leading position at the top end of the market, with continued investment in the SIA premium product and now a new full-service airline in India. India has always been an important market for SIA. Over the last two decades the carrier has been interested in growing its own services in India and leveraging its strong presence in the Indian market by investing in a local carrier. SIA made its first bid to launch a joint venture airline in India with Tata about 18 years ago. But Indian authorities rejected the proposal, introducing a new rule prohibiting foreign ownership in airlines that remained in place until last year. At the turn of the century SIA and Tata also made a bid together for a stake in Air India but dropped the proposal after the government decided not to go forward with privatising the flag carrier. India’s strict foreign airline ownership regulations finally changed in 2012, freeing up foreign airlines to acquire up to 49% stakes. AirAsia was the first airline group to take advantage of the new foreign direct investment policy, forging an agreement with Tata to launch a joint venture low cost affiliate. This greenfield operation acted as a test case for the regulations which were ambiguous as to whether foreign airline investment was permitted in start-ups or only in existing carriers. Approval by the Foreign Investment Promotion Board in Mar-13 clarified that investment in new ventures is permissible, although a legal case contesting this is currently before the Delhi High Court. AirAsia India is currently going through the approval process and aims to launch services by the end of 2013 with a focus on connecting secondary cities. Etihad was the second foreign airline group to respond to the opportunity, concluding a deal in Apr-2013 to acquire a 24% stake in Jet Airways, India’s largest private full-service carrier. Final regulatory approval is expected by the end of Sep-13, paving the way for a close commercial alliance which will see the two carriers add several flights between India and Etihad’s Abu Dhabi hub and lead to Jet moving the transit hub for US services from Brussels to Abu Dhabi. SIA sees that now is the time to move forward in its long-held Indian ambitions. India’s new foreign airline ownership regulations along with expected albeit delayed approval for AirAsia India and Etihad-Jet should make it easier for SIA and Tata to secure the approval that alluded them 15 years ago. Given past experience it is possible that Tata Sons would have discussed this at the highest levels of government prior to making an announcement. It is to be hoped that the JV does not become a victim of negative aviation politics as was the case in the mid-1990s. “With the recent liberalisation, the time is right to jointly bring consumers a fresh new option for full-service air travel. We are confident the joint venture airline will help to stimulate market demand and provide economic benefits to India,” Mr Goh said in a 19-Sep-2013 statement announcing the signing of the MOU with Tata. Mr Menon will be chairman of the new carrier, which will be funded by an initial joint investment of USD100 million. There will be a three-person board, with two representatives of Tata and one from SIA. A management team will be appointed later. No decision on branding or product has been made but the carrier is expected to initially focus on domestic metro routes which are most-suited to full service operations. For competitive reasons this is also a good time for SIA to make a move. SIA and Tata need to establish and launch a new full-service airline before other groups make a similar move. Indeed one or two further transactions may be possible in the near-term. ANA is one of several airline groups that has been looking at the India market since the new FDI policy was introduced, although ANA has so far been focusing more on the Indian low-cost sector, particularly SpiceJet. ANA recently made a much smaller investment in a full-service airline in Myanmar but could re-look at the Indian market as it continues with its new strategy to invest in airlines from other Asian markets. The Indian domestic market has become increasingly dominated by LCCs and the demand for full service, two-class operations is largely limited to key metro routes and that too at certain times of the day. Nevertheless, following Kingfisher's exit there may be room for an appropriately positioned full-service carrier in India to compete against Air India and Jet Airways. Without the legacy issues faced by the latter two, Tata and Singapore Airlines may be in a position to establish a more competitive, hybrid business model, offering a high quality product with a lower cost base that then incumbent full service carriers. And the greatest potential may be on international routes. With India's largest international airline, Jet Airways, expected to focus on developing its network around Etihad's Abu Dhabi hub following regulatory approval, this may create space for an Indian long haul carrier to offer point-to-point services. Under current regulations the Tata-SIA JV would need to operate for five years on domestic routes before being permitted to launch international services, however this restriction is expected to be relaxed in the near future. The Etihad-Jet and AirAsia-Tata applications have already been met with some scrutiny and delays. AirAsia India is yet to receive its no-objection certificate. The lack of clarity with respect to the government's policy on the issue of new airline licences does create some uncertainty. And while there is no specific regulation that restricts an investor from holding stakes in two carriers as Tata Sons would under the proposed arrangement, the venture may be subject to evaluation by the competition authorities. With two new airlines from Tata at both ends of the market, competition will intensify. 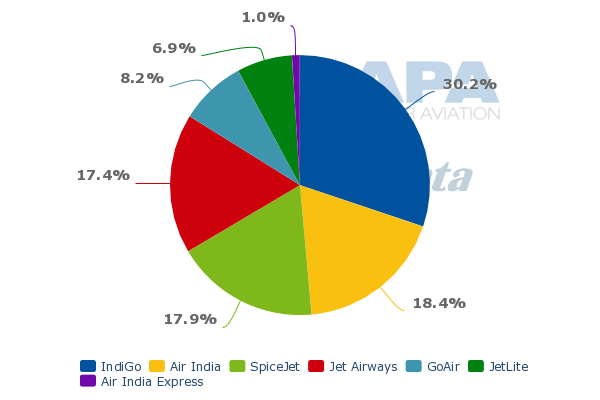 AirAsia India and Tata-SIA would be India's seventh and eight domestic carriers (including Jet Airways subsidiary JetLite). Air India also has an LCC subsidiary which operates in the international market. The market could struggle to support a further influx of additional operators. But more start-ups could still emerge as India is one of the world’s largest growth markets and FDI had opened up new opportunities for more investment. Air India could also potentially be re-invigorated if it was not excluded from foreign airline investment although its future will undoubtedly come into question as more private carriers enter. A stronger Jet following the Etihad tie-up and the new SIA joint venture will inevitably pose new challenges for the already struggling flag carrier. India is already the world’s sixth largest domestic market but is only the 19th largest international market, smaller than even Switzerland. With a population of more than 1.2 billion and a growing middle class rapid growth in the aviation sector is guaranteed, particularly in the international market – an area SIA and Tata will be keen to focus on after launching with domestic services. Over the last decade international traffic to/from India has been a strong and steady performer, achieving positive growth every year even during the economic slowdown. This is in contrast to the more volatile domestic market which has seen bursts of hyper growth interspersed with a couple of years when traffic declined, most recently in FY13. Domestic growth has been led by the vibrant LCC sector. About 65% of domestic capacity in India is now controlled by LCCs. AirAsia India and the new SIA-Tata carrier will need to operate entirely in the highly competitive and still generally unprofitable domestic market for the first five years unless the restrictions on operating international services are removed. In the international market, foreign carriers have traditionally dominated, with SIA near the top of the list. 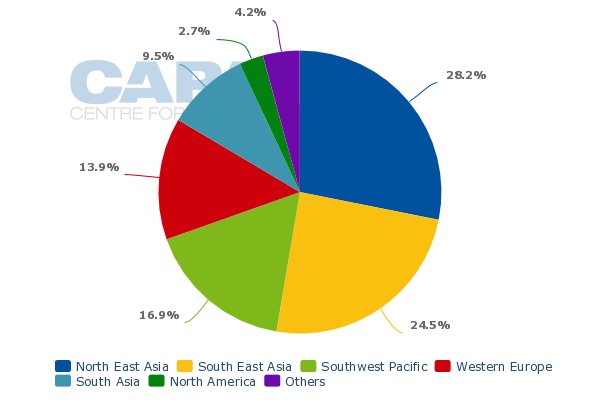 Foreign carriers currently account for about 65% of international seat capacity in India including a 4% share for the SIA Group (includes SIA and regional subsidiary SilkAir but excludes SIA affiliate Tigerair). 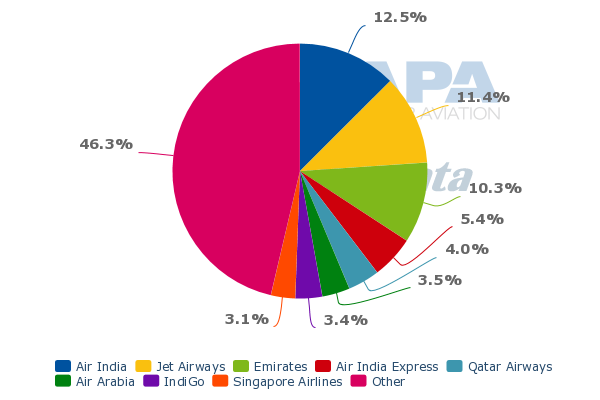 Emirates is the only foreign airline group with a larger slice of the Indian market. The SIA Group currently operates 107 weekly flights to 11 Indian destinations, including 66 flights for SIA mainline to six destinations and 41 flights for SilkAir to eight destinations (there are three destinations to which both brands operate). SIA low-cost affiliate Tigerair also operates 42 weekly flights to six destinations (five of which are also served by SilkAir). Combined SIA, SilkAir and Tigerair have 58,000 weekly seats in the Indian market. This will increase over the next two months to almost 65,000 weekly seats driven mainly by additional SIA capacity on the key Singapore-Delhi route. This is just under half the size of the Air India international operation and over half the size of the Jet Airways international operation. The SIA Group has been interested for years in further expanding its India services but has been limited due to having exhausted bilateral entitlements. The upcoming expansion for Singaporean carriers was made possible by a new air services agreement forged by India and Singapore earlier this year. But India only agreed to expand capacity allowed under its bilateral with Singapore by a modest 10%. A new Indian joint venture carrier will likely operate alongside SIA on India-Singapore routes, using traffic rights available for Indian carriers. As is the case in several India-Asia markets including Malaysia and Hong Kong, the Indian side is currently not fully using its rights while Asian carriers are capped out. Having a sister carrier in India would give SIA a competitive advantage over its competitors including Malaysia Airlines and Cathay Pacific as the group would be able to increase Asia-Singapore services and offer domestic connections in India. The airline is also expected to operate point-to-point services directly to other destinations in Asia, not necessarily via Singapore. The new carrier would also enable SIA to penetrate India’s westbound international markets, in particular India-Europe. SIA could potentially flow some of its own passengers to secondary destinations in Europe via India, providing a bigger European network and closing the gap with the Gulf carriers, which offer a wider range of European destinations. Services to eastern North America would also be a potential draw with SIA using India as a transit hub for its own services and services from the new joint venture carrier. SIA currently serves New York and Houston via Europe. SIA is already is a leading carrier in the India-Asia, India-Australia and India-western US markets. Having a local partner will cement its position in these important markets. In terms of countries, India is SIA’s sixth largest market with a 6% share of seat capacity. 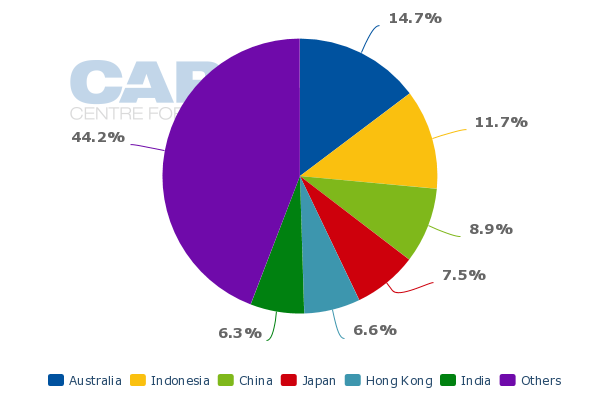 India will overtake Hong Kong at the end of Oct-2013 and become the fifth largest market for SIA after Japan, China, Indonesia and Australia with about a 7.5% share of seat capacity. Once again, the Indian share could be much bigger with a strong partnership with a local carrier. Just as the Jet-Etihad deal opens up access to India that Etihad could not get before, the SIA-Tata deal will open up access to more India flights. SIA’s new strategy has Asia-Pacific at the core. And SIA has the cash to invest in existing and new Asian airlines. In late 2012 the group sold its stake in Virgin Atlantic, which provided limited synergies. SIA over the years realised its earlier ambitions to compete in the trans-Atlantic market no longer made sense to pursue. Australia is a more strategically important market, accounting for 15% of SIA’s seat capacity. The Virgin Australia stake was a much better fit for the new SIA. But SIA still needs more partners. India and China are its biggest white spots. SIA only has a limited codeshare with Air India and did not have any codeshare partners in China until earlier this year when it forged a limited deal with Shenzhen Airlines. SIA is actively pursuing more partnership opportunities in key strategic markets and will pounce if an opportunity arises to acquire an equity stake in a Chinese carrier. SIA in 2008 saw a deal to buy a stake in China Eastern fall through. As is the case with India and Tata, if conditions in China change and the government can accept a tie-up with a foreign carrier, SIA will not be shy to respond. While SIA remains a relatively conservative company, Mr Goh has proven the carrier can be aggressive and ambitious. It picks its spots and patiently waits until it sees an opening. Mr Goh has now made three major moves, with launching Scoot, buying a stake in Virgin Australia and now signing an MOU with Tata Sons. He also has made several smaller but still significant moves including increasing SIA’s involvement in Tigerair and accelerating expansion at SilkAir. The new SIA Group strategy is now mostly written but could have one or even two more pieces before it is deemed complete. It is not about the short-term. Over the next few years SIA’s profits will continue to be under pressure as competition in its main markets and in the premium sector, which remains its bread and butter, is intense. Market conditions in cargo and Europe, two important revenue generators, also remain unfavourable. But SIA has the patience and the cash to wait for its long-term strategic moves to bear fruit. In India, SIA will certainly need patience. A long list of regulatory approvals will be required for the new JV and in India no one can ever predict how long this will take nor can it be assumed that anything is a done deal. The regulatory and policy uncertainty in India has been one of the greatest impediments to the entry of serious players. If launched, the new carrier will have to compete in a challenging market where profits have so far proven to be elusive. The fundamentals of the Indian market should eventually improve but patience and initial losses may have to be withstood. The five-year rule requirement to operate domestic services, if it remains in place, will particularly limit opportunities and make profitability difficult in the initial years. But a strong, well-capitalised carrier with the support of an airline partner with proven credentials will be very positive for Indian aviation. SIA will also have to be patient as Tata is juggling two airline projects with completely different partners who are keen rivals in Southeast Asia. With SIA and AirAsia, Tata is going into bed with the best of Southeast Asia at both ends of the spectrum. It is a logical move to seek both a low-cost and full-service carrier, following a strategy pioneered by Qantas with Jetstar and followed by many others including SIA with Scoot. But to pursue the strategy before even launching the first airline is bold. And to balance the strong personality of AirAsia and Tony Fernandes with the polar opposite of SIA and Mr Goh could prove to be a challenging, although potentially, rewarding task. There is a long road ahead filled with challenges as SIA and Tata again try to pursue their dream of establishing a full-service carrier in the dynamic Indian market. But the rewards and opportunities for both parties are potentially huge.